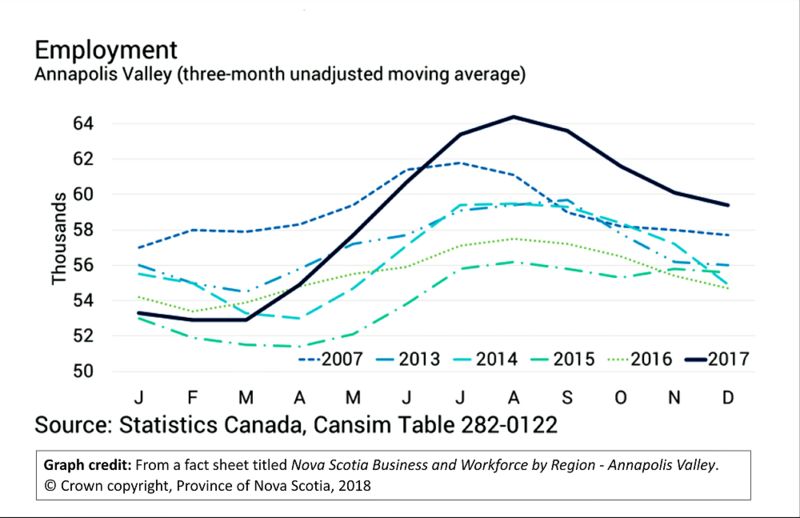 A jobs spike in the middle of 2017 pushed annual employment significantly higher in the Annapolis Valley compared with 2016. Preliminary labour force data for the 2017 calendar year shows strong growth in employment in the Annapolis Valley economic region. * The spike in jobs for the whole year reflects historically high employment levels reached in the middle of 2017, as shown in the graph above. By sector, the largest jobs gains in the region were in health and social services (+1,600) and construction (+1,100). The greatest job losses were in manufacturing (-700) and transport and warehousing (-500). Employment in the Annapolis Valley increased by 3,700 to 59,100 in 2017 (up 6.7 per cent compared with 2016). The labour force in the Annapolis Valley increased by 3,800 to 64,000 in 2017 (up 6.3 per cent compared with 2016). The average annual unemployment rate in the Annapolis Valley decreased 0.3 percentage points to 7.7 per cent. *Comparing the preliminary annual estimates for 2017 with the annual estimates of 2016. The counties of Annapolis, Kings and Hants make up the Annapolis Valley economic region. This information, and the graph shown above, were provided in a fact sheet on business and workforce trends, prepared for the Valley Regional Enterprise Network by the Province of Nova Scotia, through the Department of Business (see page 2 of the fact sheet). More details on the provincial labour market are provided in a January report from the Nova Scotia Finance and Treasury Board: Labour Market Trends – December 2017 and Preliminary 2017 Annual. We are in the process of hiring for a Connector Program Coordinator who may be the right person for you to chat with. They should be in place by no later than the middle of May. In the meantime have you spoken with NS Works, or approached community groups like the Chamber, VBLI, and Fusion AV.